Winds are frustratingly light. I'm making my way north of the Falkland Islands before heading more NE. Catching up on sleep and tidying up. Here are a few photos from way down south! #1 Statan Island. First sighting of land in two months!! #3 The sun!! I see so little of it down here! #4 Me in the back where I have spent a lot of time recently working on the auto pilot. Hi Abby,praying for some wind for you. God Bless you this Easter and may your journey draw you closer to Him. Did you figure out what the issue was with the auto pilot? If so , were you able to fix it so it is working again? Hey Abby, great Photos! Looking good! Some of us well-intentioned, but in my case insufficiently informed, though always caring, bloggers, such as @Gerald retired army auditor, Kim h. and others in previous posts, are wondering about your speed and projected arrival date in relation to your food supply. In other words, Abby, we don’t want you to starve!!! Your web site says you have 6 months of Mountain House freeze dried food, and as Gerald pointed out, at current speeds you may run out before arriving home. So, I am guessing that as freeze dried food is both light-weight and relatively small, you probably have more than 6 months worth on board? Some of us would feel better if we knew that to be the case. Of course, Wild Eyes is a very fast boat, and given good winds you will make speedy progress from now on thereby making up for lost time. But the weather being what it is, and with most of us being attached to regular meals, I want to make sure you are properly provided for. Although, I suppose there's always fish! We love following your journey, great pics. Happy Easter from the Strads in Pittsburgh Pa. Go Abby! Fair winds Abby watch out for rouge waves. Thanks for the pictures Abby. Looks like Charlie is staying nice and warm. Be careful working around in that tight space in the stern. I almost got stuck once in my boat doing that. Where is your little brother when you really need him huh? Carry on skipper. You are doing great. You and Charlie take care... Sorry to hear (and see) about the continued troubles with the autopilot, but anything that can afford time away from the tiller merits your attention. You are doing a great job! Stay safe, enjoy yourself, know that many are thinking of you, and continue to thrill us with your accounts. How's the weather now? Warmed up any yet? Great to see some 'phots! Keep them coming as the saying goes " A picture says a thousand words." As you had the foresight to put your camera gear into waterproof attachments would be great if you could get a video of some of the conditions you are experiencing above decks - with all the movement caused by current sea state. Luck with the Auto Pilot. Nice to see pix from your world! Charlie Pelican looks warm and bundled up . . . hope he's left you some warm gear for yourself. it looks cramped aft working on the autopilot . . . it would be a tight squeeze for me. Stay warm . . . clipped in . . . and may you get some good winds soon! Abby: What's the latest with the auto pilot? Is it a hydraulic leak? Thank for the photos. You are #1 on the prayer list daily. How are the hands? Are you able to sleep? You look tired. God Bless you and keep you! I've been enjoying your journey very much, and wish you strong winds and a Happy Easter! . . .cool. . .
Abby - I've been following your progress since you left California and am amazed at your courage and determination - I hope you get that auto pilot worked out soon. BTW I've been following Jessica's progress too - you are both amazing young women - keep it up. Brian (ex pat Aussie now in Seattle). Great to see pictures again! Congrats on making it around the Cape. I'm so completely fascinated by what you're doing! I doubt I would have been so willing to let my daughter make this trip at 16 but it's amazing to follow your trip. Thanks for keeping the rest of the world updated with the blog and photos. I wish you safe voyage and well wishes from sunny San Diego! Don't let Charlie fall over-board!!! It would be like Tom Hanks losing "Wilson" in Castaway! No wind = great time to catch up on sleep! As Angela said, by going North, you're avoiding all the bad stuff that Jesse went through. Your voyage may be less eventful, but no reason to put yourself in harms way just to do it! @ Grant - What's the big deal about the main autopilot? Can't Abby just hand steer, and then drop her sails and toss an anchor in if she need to sleep??? All supporters, lets rally to King Neptune to send more fair winds and following seas to give our Skipper Abby about 15-20 knots. Skipper, sail on, safe and dry. Where is tech support from the autopilot manufacturer? It seems that they have a VERY shaky reputation to protect and they are failing you at every turn; I'm going to look them up. A few thousand scorching emails ought to inspire them to help or go bankrupt. I'll post their info here when I find it. Be careful, hydraulic fluid is nasty stuff. #3 Really a fantastic photo! Well done on rounding the Horn! I'm really impressed by you and your brother's courage and commitment to such a tremendous voyage. Good luck and Happy Easter! Thanks for the great pictures. Looks like Charlie is chillin' with the Beanie on while you are doing all of the work! Whatever happened to the "crew" doing the work? Yeah Grant... why can't she just anchor for the night? That's what all us sailors do is it not!?!? Abby: Would it be possible for someeone here to contact the Mfg of the autopilot, and perhaps coach you through the repairs?? ?...if the home team has not already been doing this? I hope you're already doing that, but if not, let us know. Im a mechanic and might be able to assist. Thank you for the pictures today! I loved the picture of Staten Island, I didn't realize you were so close to New York already. Just kidding. Thinking of you and praying for your safety again. Roast 'em for not helping Abby. She can't head out across the South Atlantic without TWO working autopilots. One blogger on another site said that CourseMaster is brutal on the boat in a heavy sea and you have to hand steer in that situation. Let's see if we can't get Abby some help out there. I just got back from visiting my daughter in Toronto to be greated by your photos....thanks. It was thoughtful of you Abby to photograph yourself at work in what looks like cramped quarters...nice to see your smile. I was wondering if Charlie's tongue was FROZEN to the winch and he can't get free....given he is I might note in very fashionable winter clothing? My favorite photo is #3 of the sun...great shot Abby. A wise person recently said, "we do not remember days, we remember moments". Congratulations on being the youngest solo sailor to round Cape Horn. Thanks for the georgeous pics. I'm glad you have sometime for maintenance. For the people that are worrying about the food supply. If you unwrapped Charles maybe he could attract some female pelicans and they could be coaxed into doing some fishing for you. Would that violate the "unassisted" provisions of the rules ? Abby - stay warm and safe. Have peaceful Easter. It's not still 01apr is it??? So nice to hear from you and see your very special pictures. They are great. What a thrill it must have been to see land again. I hope that soon you will be getting more sun as you sail North, and enjoy its warmth. But the most special picture is of you, Abby. Very precious. Sail on dear one and God speed. You are awesome and thank you for sharing your journey. Stay safe and sail on. Great pictures Abby and Thank You!! You and Charlie look very happy. I hope it doesn't take you too much longer to get your auto pilot fixed. One that you will always remember. @Bonnie You are correct. If Abby only has one autopilot functioning, and if that autopilot were to go out, she could sail the boat by hand and then drop the sails to sleep. You ask about an anchor. She couldn't toss an actual anchor very efficiently in the middle of the ocean, but she could deploy something called a "sea anchor" which is basically a big bucket that creates drag, to keep her head-on to the seas while she sleeps. - It would cut down on the miles per day she would be able to sail. This is a problem because she only has food, water, and other essentials for X number of days. And dropping sails every day would reduce her rate of progress, adding days onto her journey. - Adding days to Abby's journey is problematic in that it is already Fall in the Southern Hemisphere, and we would like to see her home before winter sets in -- with its generally rougher weather. - While Abby could drop her sails to sleep, what does she do to prepare a meal? Go to the bathroom, Or to check her AIS warning that a ship is near? - How does Abby reef the mainsail, or lower it, without leaving the helm? This would make for some dangerous deckwork, especially if wind and seas are up. - If she raises the mainsail in 10 knots of wind in the morning, and if the wind builds to 35 knots during the day, how does she reduce sail if she can't take her hand off the helm? Assuming the halyards lead aft, she could dump the halyard, but the sailcoth must still be gathered in and tied down, and as soon as she leaves the helm to do this, things could get dangerous for her in a hurry as the boat changed its position to the wind and seas. 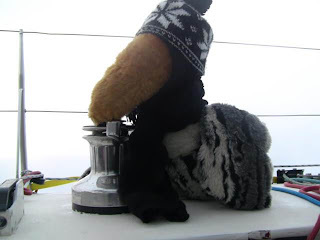 - How exhausted would Abby be if she had to stay on the helm for 18 or 20 hours a day? So, losing her remaining autopilot wouldn't be the end of the world. But it would mark the begin of an extraordinarily difficult -- and hence dangerous -- phase of her voyage. This is why it might be good to hang around the vicinity of the Falklands for a day or two to determine whether she can actually fix it or not. If she can't, it seems prudent to pull into the Falklands and order replacement parts before heading off across the Atlantic. If the remaining autopilot fails midway across the Atlantic she can put into Johannesburg, South Africa for repairs. If the remaining autopilot continues to function, and she leaves Jo-burg in her wake, things get a lot dicier if it should go out in the middle of the vast Indian Ocean -- even deeper into the Fall. I've got a 30-foot sailboat that I sometimes enter into singlehanded races (which only last for a few hours, on the very protected waters of Puget Sound). So I know how things that are completely simple and routine with a crew (or an autopilot) can turn into major headaches when singlehanding. I believe this is a safety issue, and because I want Abby to complete her trip safely, I keep asking about that autopilot. If it can be fixed: Hooray! If not: Head into the Falklands and have a new one shipped out. Especially on a high-performance boat like Wild Eyes, it is dangerous for a singlehander to be caught offshore without an autopilot. Great pics Abby. Thank you. Pics are always welcome. It looks to me like Charlie's not clipped on. I hope I'm wrong. You/we don't want any crew going over the gunwale. I can see from your confinement that working on the autopilot ram isn't your favorite job. I've no doubt that you'll get it repaired though. That'll make the effort worth the trouble. It's really good to hear that you're getting caught up on some sleep. Happy Easter Abby, maybe you'll find an egg or two in you food bag in the morning. If not, what the heck, Mountain House makes some to die for scrambled eggs. HA! Safety is always job #1, Abby. God is with you. So are we. Thank you, love those pictures Charlie looks so cool, glad to see you’ve got him all ‘rugged’ out. You did come pretty close to land, I hope you enjoyed it, could you smell it? Nice picture of the sun and the sea, which looks a little choppy, but that’s the way you like it…Yes??? And you look pretty comfortable in your work area, are you sure you’re not snoozing back there…lol…I hope you can get it fixed before you start across the Atlantic. Well Abby, I’m glad that you’re catching up on some much needed sleep, and of course getting things straightened out. Are you doing much cooking, baking or fishing? What are your eating habits, what do you enjoy? I just hope you’re eating well and getting plenty of liquids in you. I know, nag, nag, nag……..
Just make sure you take good care of yourself and the crew, how was Mr. Doggie dressed??? Thanks again for the blog and the pics, I really enjoyed them. Keep up the good work. "Can't Abby just hand steer, and then drop her sails and toss an anchor in if she need to sleep???" Anchor? In mid-Atlantic with 15,000 feet to the bottom? She needs 2 autopilots to safely make this long leg. Can anybody hand steer a sailboat for 18 hours a day, in mid ocean, for 20 straight days? Great to see some pictures of your world, hope Charlie and you are enjoying the ride! Get some sleep while you can. Praying for your safe journey, and some more wind to get you on your way. Keep up the good work, and thanks for sharing the pics! There are times when it is simply too dangerous to be on deck. When Jessica Watson was hit by the unpredicted near-hurricane-force winds just some hundreds miles from where Abby is now, she had to go down below, tie herself in, and pray that her autopilot continued to function even as her boat was dumped upside down by a series of huge waves. We don't want Abby in the cockpit when breaking waves could pound her around on her tether, or toss her over the side, having to pull herself back to the boat with her tether (which would likely be impossible if the boat continued to move through the water). And if her boat does go upside down, we want Abby to be inside the boat, taking advantage of its safety buoyancy features and air pockets, rather than sitting on the bottom of the boat, trying to hang onto the rudder or keel, away from her satellite phone, food and water. Admittedly, she could, with enough warning, drop all sails and lash the helm over and try to ride out a storm below decks. But with a high-performance boat like hers, I don't know how well this would work, and it certainly wouldn't be as safe as having the autopilot holding an optimal course for the wind and waves. Maybe other sailors on this blog can chime in. I'll confess to having a cautious nature when it comes to sailing, but sailing is something I've done for more than 40 years, including ocean passages with great crew that still seemed daunting. Abby deserves a backup autopilot. What is the risk of putting into port to get a 2nd autopilot? That her voyage is no longer nonstop/unassisted. What is the risk of continuing the journey with no backup autopilot? Considerably more. Happy Easter, Abbe! Hopefully the Easter Bunny found you and left some special treats. Abby re-jiggered the display of the primary to the secondary and all is good. However in order to isolate the leak (id'd from a pool of fluid only), she would need to get the primary working again and watch it, to see where exactly the leak is coming from. Therefore she'd have to re-do the above. Basically park somewhere, reattach the working display to the leaking drive, and watch it as it works to see where exactly the leak is coming from. There after, they all come with repair kits to seal leaks using basic tools. It's just a matter of locating the leak itself. No one sounds too worried through the postings except us! Latest map shows only 50 miles West of the Falklands. There are a few radio stations on there, you can try to get some reception, probably be nice to hear radio music and ads, and news. I think AM with luck upto 300 miles and FM also with luck upto 60 miles. Well done Abby! What's the best wind strength for getting the best speed out of Wild Eyes? Are you sailing with full main at the moment? According to weather forcasts for the Falklands there is wind out there - must be frustrating if you're not in it! Wild Eyes should be a fast boat so hopefully your pace will pick up but presumably you are a bit concerned about being significantly behind your expected schedule. Although you're heading north, the South Atlantic is often not a friendly ocean especially as the southern hemisphere winter approaches. Come on Wild Eyes - show us what you're capable of! I do a weekly radio show here in Western Massachusetts on WMUA FM 91.1, Blue Monday 6:00 AM - 8:00AM EST. My entire production crew will be making a weekly update about your trip (It is really just me, we are a small station:=}We are a college and community radio station. Nearly all of us are volunteers.) I am excited about your adventure as it is something we can only dream about. Who knows who you are inspiring to get up and engage the real world. We will be following your progress. Keep on sailing and fair winds to you skipper. Two days ago I was looking for movie tickets for me and my father and just so happened to stumble upon your story. After reading the article I said to myself, “She can’t be serious about this, can she?” Being intrigued I dug deeper. Abby Sunderland, you are an amazing and beautiful person for not only pursuing your dream but by doing it at such a young age! 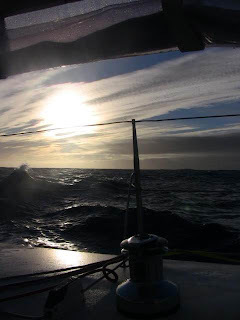 Melody Beattie said, “nothing dies slower or more painfully than a dream.” You are living yours Abby, you sailed pasted Cape Horn the most southerly point of South America just a few days ago! There is a big part of me that envies you but, there is a bigger part that wishes you safety, steady winds and brighter days. Keep being your amazing self Abby; I’m looking forward to following your journey around the world. 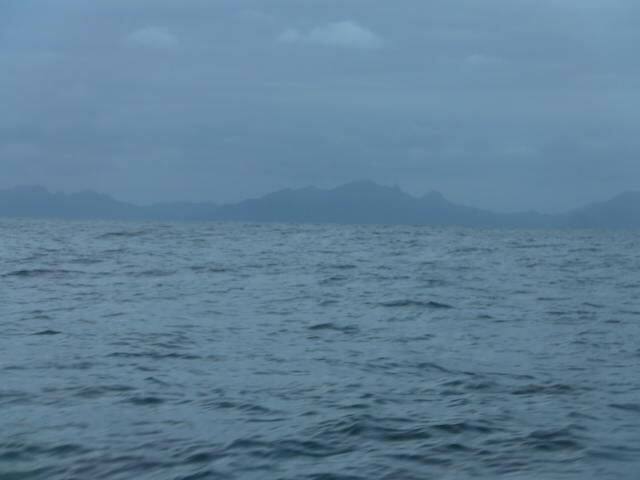 The average ocean depth on this planet is over two miles deep and almost seven miles at the deepest known point. For an anchor to properly hold, it is generally necessary to have a rope or chain that is 5 to 10 times longer than the anchoring depth. Anchoring in the average ocean depth requires at least ten miles of nylon rope. This presents at least three obstacles. 1) This length of rope weighs nearly enough to cause it to break from its own weight. 2) The required ground tackle (anchor, rope and winches) weight exceeds the safe carrying capacity of a boat this size. 3) If one and two were not a problem, it would take several hours to pull this length of rope. Anchoring is a dangerous activity that is only practical in fairly shallow water. I use a modestly sized 40 pound anchor with a boat much smaller than Abby’s and know getting hung up in the ground tackle will take me to the bottom even with a PFD on. Thanks for the pics, pretty awsome! Happy Easter and have a safe jouirney! Warming up at all yet? Thanks much for the pics. Happy Easter! Maybe you will find fresh eggs and chocolate bunnies in your galley this morning. And Jelly Beans. At least, we THINK they are Jelly Beans! We are all very proud of you. You are our Shining Beacon and we all pray you continue to have a safe and speedy voyage. By the look of your route map, you are really flying along, Abby. All the best. Happy Easter my dear. I hope you have had a good day today and maybe made some progress on fixing your auto pilot. I'm pleased that you don't get clostraphobic in small spaces like me! Charlie looks nice and warm. I hope he didn't pinch any of your warm clothing. Take care my dear Abby and God Bless you heaps. ready to go skiing. Be Safe! Hope this will get a little wind action in your sails. Great work, nice pictures too. Rounding the Cape happened so quickly its hard to believe, of course a fast boat and an expert sailor helps too! @ Grant and other bloggers including myself are concerned about the autopilot hydraulic oil leaks. No doubt you have discussed it with your shore team too, and are attempting to fix it. I suggest checking the simple things first;... have you checked that all the oil line connections are tight ? Is the reservoir overfilled and backing up? Does each autopilot have its own separate hydraulic system or do they both share the same oil reservoir ? If the leak is from the ram seal, even if you had a new seal, replacing the seal without the proper tools would be difficult if not impossible. Perhaps you have a spare ram? The Indian Navy sailor, Dilip Donde had some serious problems with his autopilot and he stopped at Port Stanley for repairs. All this is worth considering, as you know, the record is nowhere near as important as your safety. Kind regards and be safe. Nice pics Abby. The island looks pretty cool off in fog like that. Was that a bit a jolt to see land after so long? I like seeing the pics of you and your circumstances. Did you mean you're now passing the Falklands? Or, that's your plan before turning NE. Doesn't seen like you'd be at the Falklands already. Take care, good luck with the a-pilot. I'll keep watching for you. No sight of land for two months! You must feel a little like Christopher Columbus! Good to see you Abby, Happy Easter by the way. Is it really that cold down there? charlie's all bundled up. Happy Sailing and Happy Easter! Hey Abby Happy Easter, How you doing? Well congradulations on making it as far as you have. I hope you are doing well and that everything is going to plan. I also hope that the auto pilot situation has been resolved or its on its way. Keep up the good work girl, you are doing a great job. Take advantage of the smooth sailing. May be slow but you get a chance to rest up for the next leg. Thanks for the pics. You're a pretty good photographer. Hey, well at least you get to see some sun to make ya excited! On this beautiful Easter Day we celebrate so may things, including your successful voyage. Nice pictures. Its so good to know that you are well and happy. Remember you are never alone, you are always thought of, watched and cheered on. As always, the Spirit of Brasil is with you. Have a great Easter! Abby, thanks so much for the great pics. You're doing such a great job. Abby! You're fellow. That's great to be one in the middle of the ocean and feel what you are small in comparison with the world. Associated wind you! You are such an inspiration, everyday I look to see where you are look to read your posts. What a great adventure. There must be millions of us out there that think of you off and on all day long. When I read of your progress and that you’re safe, I smile and smile… you’re a like a superhero, someone for the whole world to be proud of. Epic journey~stay safe sweet angel thanks for sharing your views with us! Thanks for the photos. Charlie looks a bit chilled though. Happy Easter to you, thank you for the update, The Pictures look great. Charlie looks like a warm …….cool cat ….Uh…… bird I should say. Glad you are headed northeast for better and warmer seas, And away from land. Now you are into your trip and can have a blast sailing you look beautiful in the picture, A little cramped huh! I love your blog and keeping up on your adventures. I have a 16 year old daughter and your example enables me to see even more potential in her as I read about your courage and perseverance. Thanks for sharing, I look forward to your posts and share them with my family. You are doing a great thing and my prayers are with you. Blessed Easter Abby. May the light of Christ say to you "this is the way, sail in it!!" Happy Easter, Abby! Praying for smooth seas, gentle winds, and blue skies for you sailing pleasure! To Grant from Seattle - Your knowledge of sailing is impeccable, but you may want to check out a map of South Africa - Jo'burg is inland! happy easter abby!! i hope you get to skype with your family :) love the pics! @Grant and other boat people. Now you have really got me confused and raised my curiosity to new heights. I have always assumed there is only one hydraulic ram system (pump and plumbing) and the electronic auto pilots are both connected to this one system and a flick of a switch determines which auto pilot is used. But Abby's original description of the leak problem does seem to suggest it's the way you say with two rams, each auto pilot controlling its own ram. So Grant and Steve in CA, which is it? This is why I asked Abby, and was criticized for it, to shoot a video of the ram working the tiller. A video of the mechanical workings of the boat would be very informative for many of us. Great to see the continued progress! Love looking in every couple of days, and so pleased to see Cape Horn was behind them. Glad to see that you are making progress. Keep on keeping on. We are praying for your safe journey. HAPPY EASTER! I’m sure that you’re missing family and friends today but there are many of us thinking of you. Hope you have a few goodies to treat yourself today. It looks like you have by now passed to the west of the Falklands, so I imagine that the weather is warming a bit. Thanks for the great pictures. I’m sure that it was very nice to finally see land after so long. Charlie looks like he’s in his element. I think that he is really enjoying the trip. Good luck with the autopilot, Abby. Hope it is resolved soon. For those questioning if Abby would be able to continue her trip without an autopilot, of course anchoring would not be an option, in part due to the depths. When I commercial fished off of the NW coast of the US, I would usually work approximately 20 hours a day and then shut down the engine and drift for about 4 hours while I got some sleep. Weather and sea conditions determine whether drifting is feasible even when utilizing a sea anchor. However, I had the luxury of running into port every 10 days or so to rest a bit for a day or two before heading out again. Many think that hand steering for 18 hours can’t be very tiring, but believe me, it would be very exhausting if done for an extended period of time. As a solo sailor, you need time away from the helm to take care of all other tasks necessary to maintain your vessel not to mention to maintain your sanity. Anyone who has just gone out on the ocean for a day of fishing or cruising knows that the glare of the sun, the motion of the swells and the wind in your face can tire you very quickly. It takes a great deal of stamina for theses solo circumnavigators to complete their grueling marathons. They certainly have my total respect and admiration. Great Photos! I hope you get your Auto Pilot problem sorted out soon, and from what other people have been saying, it would be very difficult to sail across the Atlantic without it! I hope you see some more sun as well as good winds. Really enjoyed the pics and it is good to see Charlie is keeping you company. I am so enjoying your experience. Maybe Charlie can get that auto-pilot going right. The best always. As Grant, Roski and other early bloggers know, the autopilot saga dates waaaay back to pre-launch at MDR. I too have serious concerns regarding the systems but, consider guys, Coursemaster's reputation is one the line big time here.....all the trick advice is good chatter but, but you KNOW that either Abby herself, or her team, is in deep contact with the best advice that Coursemaster can provide. Here's a another thought: In my sailing heyday I developed a reputation for repairing marine heads while at sea but working below while underway in that space was luxurious compared to the space that Abby is working in to handle the autopilot problem AND the boat is rockin' and rollin' along all the while. Add the reek of hydraulic fluid, busted knuckles and cramped muscles .....that's one tough SoCal girl riding that boat. Leaky hydraulic system parts, packing glands and seals etc., will expand (slightly) as the ambient temp rises. Leaks subside - disappear. Let's be patient here and a few more days yet; let Nature take Her course... no need to hollar "Calf Rope"... Capt. Abby has the watch... I'm confident. Hello Abby. I just found your blog on this Beautiful Easter! I'm in Grand Rapids Michigan and hope and pray your having the time of your life! "Wish I were there". Just keep living your life to the fullest. Nice to meet you. In my haste to write you a comment last night I forgot to wish you, your family, your team and the 5284 plus blog family a HAPPY EASTER. @Grant...I enjoy your very interesting comments. Hope your day is going well Abby...super sailor. OK you got my attention. Even as a landlubber I knew the autopilots were a problem, but I assumed the situation was all in hand and that they would soon be repaired. But now you really have highlighted the seriousness of the situation. I suppose if they were fixable, they would be fixed by now!?!?!?! So it seems that all you sailors knew right away that the malfunctioning autopilots were so important that they would either put Abby's safety at serious risk, or would totally interfere with the unassisted, non-stop part of Abby's trip. I guess some of us are slowly catching up. Most of us know that this trip has serious dangers attached to it, and that preparation, skill and good luck is needed to make it safely through. But this spells real trouble for Abby. Most unfortunate! I guess we'll just watch this space and keep up our thoughts and prayers for her continued safety. I'm sure Abby and the Team are doing their best to get a happy resolution to this. Hi Abby -- Did you get up to see the sunrise on this Easter Day? I hope you are enjoying a wonderful day at sea....getting to rest and relax a bit after the excitement of the Cape. Your smile is beautiful, but you really do look a bit cramped....must be a difficult place to work in, not to mention the bouncy conditions. You are so prepared to trouble-shoot and do repairs, I'm betting in due time you will conquer the auto-pilot problem. Hang in there! @ All anchor people...I know about anchors and depth...I really meant a drogue but I realize it does make a difference. I should have been more specific. It was the gist I wanted to get across and Grant answered my query thoroughly. Thanks Grant! You make a lot of sense. I hadn't realized how dangerous Abby's situation could get if she starts off across the Atlantic. I'm sure Abby's team will come up with the solution that's safest. I did not care for the April fools joke,they had me to believe it...Then I look and they say is joke...very mean of your team...hehehe But out there by yourself it was probably good for a laugh on your part..
A very blessed Easter to you Abby! Guess we'll know more within the next day or two. I read Abby's log every day, and follow her progress across the chart. About the only time I post is when it seems as if a potentially dangerous situation might be developing. A lot of the anxiety would be reduced if Abby, or someone on the team, could post a note that said: "Here's the deal with the autopilot. Problem is this. Our solution is that. No problems, no worries." In the absence of that sort of information, the armchair sailor is left in a position of thinking: "They really aren't going to let her continue the trip without a backup autopilot are they?" At this point I've raised the red flag I felt compelled to. Will let Abby and the team take it from there, with the hope that they keep us posted. And as I noted in an earlier posting, if she does lose her remaining autopilot in the middle of the Atlantic or Indian or Pacific, it will certainly make for a more interesting book. Good going so far, and I wish you fair winds and following seas on the remainder of your journey. Hay Abby: So you have the the Falklands on your starboard beam, good deal. That's probably why the calm seas. If you find any leaks around the hydrolics on your auto-pilot, make sure you catch the fluid in some kind of container. You may need this fluid later when you find out what's wrong with the system. If you do run out of fluid, you can use a light oil as a substitute. I'm an old union crane operator (retired), and sometimes when I blew a line, or lost most of my hyd.,fluid, I would call a mechanic. But, when your on the clock, and the mechanic is several hours away, we just added some regular oil untill he arrived. We just had a earthquake in San Diego while I was righting you this post. It's 3:45 and I'll look at the news after I'm finished. I'm guessing a 4. something. If you do loose both auto's, and have to steer with your tiller, you'll loose some sleep. NOT A GOOD THING. You can drop your sails and put out a sea anchor. It will buy you some time to catch some ZZZZZ's. I better go, my building is shaking again. OK Gang.. I give up ....How do I put pics on my comments? I admire you and your strength. Having sailed oceans myself I know what it's like out there. Are you aware that a "Sunderland" was a flying boat used during the second world war ? Another Sunderland is now flying across water ! Go for it girl !! HAPPY EASTER ABBY. I Pray that the Lord will be especially close to you today. LOS ANGELES- A 6.9 magnitude earthquake centered in Baja California, Mexico was felt all over Southern California, rocking high rise buildings from San Diego to Los Angeles, but there were no immediate reports of major damage. The preliminary magnitude-6.9 quake struck at 3:40 p.m. PT about 110 miles east-southeast of Tijuana, according to the U.S. Geological Survey. According to reports, the quake's force caused high-rise buildings in San Diego to sway back and forth around 30 seconds before rocking high-rise buildings in downtown Los Angeles." To all: take care, be safe. Sorry youre having slow wind! You know what you could do to pass time? HOMEWORK!!! Hhahaha...Im avoiding my homework too..ugh! Hope you can get your auto pilot issues worked out. Take more pictures! We love them. Wish you could do a video blog. An observance. 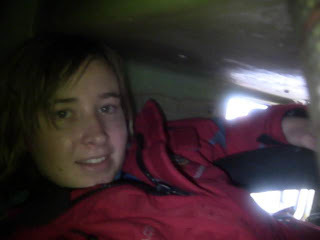 In pic #4, Abby is in a stern compartment and she says she is working on the auto pilot (nice picture Abby, you have the ability to look cool and hard at work at the same time :-)) Obviously, she is working on the hydraulic part of the auto pilot system. Back from the beginning of her trip when auto pilot concerns were brought up, it was in the context of the electronic portion of the system that's mounted at the nav station. So for me at least, the term "auto pilot" is taking on new definitions meaning the whole system. So for what Abby has said thus far, there must be two complete systems. Can anyone verify this? Two complete systems makes the most sense on a single handed circumnavigation but until Abby comments or someone else knows, I'll always wonder what is really happening. I've followed you daily but the is the first time I've posted a comment. I just wanted to say HAPPY EASTER and Praise God! I will pray for you. I am with you about the auto pilot. My guess is that you are correct. Hydraulic lek makes sense. If that doesn't fix the problem, I would suggest a process of elimination. That should solve the problem. Happy Easter!!! You can overcome anything with faith. I can't wait for Cabo. First, I hope everyone is having a happy and blessed Easter. I know we are. Second, I'm positive that Abby and Team Abby has a firm grasp of what is going on with the autopilot, and they know exactly what their course of action is. I'm also positive that they don't need any of us giving Abby (or Jesse) advice on how to fix things on the boat. Chatter between us commenters is great, but giving advice direct to Abby is silly and somewhat immature. Nobody is more concerned with Abby's safety than Team Abby and Abby. Abby, God bless you honey, and God speed you on your way. Stay safe. Great Pics!!! Was wondering if you have got that auto pilot working as of yet? plus its great to hear that you are getting caught up on your sleep. Im looking forward to reading your next posting on here and until then stay safe and God bless you My Insperation!!! #3 is bloody amazing!!! What an awesome picture! You take care in that bad weather. You have probably heard that we are still getting Tropical Cyclones in the Indian Ocean- the seas are very unstable at present- Please take care and Good Luck. Happy Easter Abby and all of her fans! HE IS RISEN!! That said, I would hope we could get a short note from Team Abby... Many of us know nothing about autopilots and even those of us who do aren't talking to Abby and/or the manufacturer. I'm quite sure they're keeping on top of this but I know it would make all of us feel better if someone could let us know how the repairs are going. Obviously that is second to helping Abby MAKE those repairs. Hang in there Abby, we're praying for you and wishing you fair winds and following seas! Thanks for the URL - CourseMaster Autopilot personnel have been contacted. I am sure that they were also contacted by Abby's team. I feel that they will provide whatever support they can. Abby you are doing just great - hang in there! Our prayers are always with you. Dear Team Abby, Can you show us pictures of yourselves at your work stations where you monitor Abby's progress. You know the people behind the senses. I'd like to see if you pulled out all your hair yet at this stage of Abby's journey. I know that you say that there isn’t much wind, but you seem to be moving along rather well. So, I hope it all continues well, or even gets better for you. I figure you’ll be around the Falkland Islands shortly, and then it’s across the wide Atlantic. Good luck on that leg of your quest, and I hope that it is a memorable cruise for you. It would be nice if the weather would change so that you could enjoy more sunny days and relax with a little R&R for a change. I would caution you on the hydraulic fluid, make sure, since you have open cuts on your hands, that you wash your hands good after getting that fluid on them. There are a lot of chemicals in the fluid so you have to be careful of infection. I’m sure you have some medical supplies on board, so take care, please!!!! Oh yea of little faith Team Abby is on it!Has always been on it! Will always be on it! Checking your blog this Easter Sunday was like receiving an Easter basket. It seemed a gift arrived from you of things I'd wanted: a picture of awesome you and your steely seas. Reading what some others wrote today reminded me of the astronauts of Apollo 13 when they were on the other side of the moon, the side with no signal, and were challenged with a problem. Course there were 3 of 'em. Captain Jim Lovell was on that flight. He is a member of the same planetary society I belong to in Illinois. He owns a restaurant there. He should be made aware that a fellow explorer could use a greeting. I'll see what can be done about that. In the meantime thanks again for your gifts. With all you have to do you took some time to share with us! May it be returned to you a hundredfold. Did someone say your dad is in the Falkland Islands??? What's he doing there? Is he going to try to meet up with you? Dear Abby, it is so nice to hear from you and to be anticipating your new adventures. I also have gained confidence and look forward to hearing what else you have accomplished. Thanks for the pics. My family had a nice Easter; you were with us in spirit. Are you catching up on sleep, reading, and enjoying glimpses of the sun! Maybe a little late but HAPPY EASTER. The pictures of the gray sky reminds me of what can be. Many times people think of the South Seas poster pictures and miss the gray gloom. Thank you for showing both sides. Today as I was headed home I was talking to one of the pilots of our C-17 and in the cockpit he had his paper charts out and we talked about paper backing up electronics and I told him of you adventure. He just looked at me and said "16?". What a fan base and growing. Internet is come and go at best for me but I know real home food is just over the horizon. Abby, continued good wishes to you and Wild Eyes. Good on you. Is it fun? I find your blog super cool!!!!!!!!! The photos are cool to. Mom and Dad, No need to say more!!!!!!!! Abby ... Hope the repairs are successful and looking forward to your next position and blog update. @James & Jan ... Everyone knows Abby is consulting with her team and between them all issues will be addressed. (I wonder if she has the ability to take a video of the hydraulic leak for her team to analyze?) But besides the point you raised giving YOU something to talk about which adds to the collective discussion, you have to remember we are all human and we identify with Abby out there alone in a big unforgiving ocean because we know that she like us needs air to breathe, water to drink, food to eat, feels happiness & sadness just like us and also pain just like us. There's a connection because we are the same species. For some, that's the definition of God or spiritual. A connection between others and the earth. Therefore to ask all to not express what they believe to be prudent advice is asking too much. It asking us to be what we are not. @ Autopilot questions: As I indicated in a blog comment some weeks ago, my experience with autopilots is limited, in that my ocean racing experience has been with crewed boats (albeit some very short handed). While not familiar with Coursemaster units, I assumed from the beginning that Abby's team would have set the boat up for two fully independent systems - display wiring and drive units (though I'm not sure how that works with the GPS interface...Grant?). That is certainly what I would have down if I were sending my 16 year old around the world alone. You've seen the pic of Abbby scrunched up in the small compartment through which the rudder post passes up and into the cockpit. In order for the hydraulic mechanism to move the rudder post some kind of flange or (what is commonly called) a quadrant is attached to the post and all that is in that space under the cockpit where the actual tiller is placed. Here is a quick visual of one a many different options for rudder and quadrant set ups. I have NO IDEA what the set up is on Wild Eyes, nor can I find a photo or construction diagram that might show us. I would assume then, that the hydraulic drive units that actually move the rudder post (via an attached quadrant) are either both pre-mounted near the rudder post in a manner that one unit can be attached to the quadrant (or flange, or whatever) at a time, OR if the set up allows only one unit in the bracket and the active unit is carried into the space and mounted, and the other is fully detached. I can't imagine a set up where BOTH are attached to the quadrant at the same time and Abby just chooses A or B from her nav station. It would also appear, for reasons that have not been explained, (nor can I guess)that the wiring and display portion of Otto A can't be be simply unplugged when it goes wonky and the wiring and display portion of system of Otto B plugged in place. Grant's expressed concern for a solo sailors safety is well founded and there's no real value in my elaborating on it, except to second (or its is place my third?) to the remark that gear break down and the sailor's own physical fatigue are a seriously bad combo. Driving for more than four to six hours at a time is pushing it in most weather conditions. Driving more than two to four in bad weather is dangerous and done only when the rest of crew is incapacitated down below wishing they were dead from mal de mer; doing it alone is, well.....not so good. "Did someone say your dad is in the Falkland Islands??? What's he doing there? Is he going to try to meet up with you?" Last I heard Abby's dad was in Chile, NOT the Falkland Islands. Has anyone heard if he stayed south...maybe to help with the autopilot? If he's going to make another attempt to rendezvous with Abby, hopefully he can get some pictures as well! Kris and Connor again. We were glad to see your pics, keep them coming if you can!! We were also glad to know that everything seems to be going well. Connor is keeping some of his Easter in the freezer for you just in case you want some!! Be well and do good work!! Glad to see all is going well, Best of luck in the new ocean. If any of the Sunderland team is down here they'd have to be using their passports so it'll be pretty easy to track them. I'll get back with you. Well, someone outbid me on the shoes while I was sleeping. I'm sure the lucky winner will enjoy them! I'm running out of luck, trying to figure out what milestones will be commemorated with personalized shoes. If there will be others, then I'd like to bid on them. But the "see more items from this seller" link isn't working. Hey -- wait, it's working now. :-D Thanks, whoever fixed that before I even got a chance to complain! @ Paula & Monique. Surely not!! If Abby's dad is on her boat off of the Faulklands, helping to repair the autopilot surely that would wipe out her solo unassisted category of her trip! Mind you would that be such a bad thing? She is still the youngest to pass under The Horn, a marvellous accomplishment and could still be the youngest around the world. You are a brave young lass Abby. Good luck Abby on your solo circumnavigation. All my good wishes to another "True Sheila"
Interesting routing update today. 20 miles South of the Falklands. Last course was North of today's position. 1. seeking shelter while effecting repairs? Not exactly a hub of the yachting community and highly doubt there's a coursemaster distributor on that island. Be lucky if there is even a fedex or dhl. "Northing" to Buenos Aires would make more sense, almost the same latitude as Cape Town, so northing up there nothing really lost in terms of passing Cape of Good Hope, and certainly better logistics than Stanely, Falkland Islands.. These are great pictures. Stay warm. Don't know if you have ever read Dove, but everytime I read your blog I think of that book. Take care! Hi Abby! Thanks for the photos! Charlie rocks! Tell him I said hi! How's everything going down there? Oh, and you inspire all of us! "May the wind always be at your back and the sun shine warm upon your face"! It will be OK!!!!! Something will work out! With God beside you, all things are possible! After days of despair, a normal comment window opens tonight. An Easter miracle? Did you see that Alessandro di Benedetto repaired his mast all by himself, in the Pacific, and this achievement lets him going on to finish his trip unsassisted? Quite amazing guy! My prayers to you for well deserved warmth and safe sailing. Abby, keep on going!!!! Looks like your headed strate to africa. Go girl go!! Blog dude, why the censorship? Anon must have said something pretty bad to get zapped! Hey, does anyone know? Does an Open40 put more pressure on an autopilot than a smaller boat would. Just wondering why there would be a problem after such a short period of time? I know Abby will sort it out! Hey, what kind of a loopa, loopa you call that move, did you hit a toll gate and not have the correct change or were you just taking a casual cruise around the Falklands….lol….I just hope everything is ok. Hope you didn’t bottom out…..I will patiently wait to hear from you. Doesn’t look like there’s much wind for you right now but I’m sure it will be picking up. So hang in there and keep the faith, it will get better. Take good care of ‘yourhands’ and the crew, stay alert and enjoy as much as you can. I’m very proud of you Abby, so keep up the good work. I noticed the Blog Administrator is right on the ball, good for him!!!! Solo sailor Dee Caffari in the Aviva had similar autopilot problems in her "backwards" 2005 circumnavigation. Yes, this is becoming as interesting as a mystery novel. Abby says she's making her way north of the Falklands and plans to head NE, but now her position shows she is south of the island. What's with the rumor about Laurence being on the Falklands? Is there any truth to this? Stanley is the best place to go for autopilot problems. I believe Dilip Donde was there for the same reason. Abby may be headed there now?! Rumor has it Abby's wannabe prom date from back before she left Marina Del Rey has been seen hanging around a local Stanley marina with a Coursemaster hydraulic cylinder sticking out of his backpack trying desperately to rent a boat. Apparently Laurence is in hot pursuit of this guy determined that Abby's trip remain unassisted. Hi Abby... About bedtime for us in Missouri. Still trying to post a pic with out comments, so you can see who is writing you. Hey looks like I did it. Land ho!! That must've been a welcome sight, even if you aren't stopping on this trip. We're watching your tracker, and see that you've made great progress since rounding The Horn. Hope you're enjoying the quieter waters, and some well-deserved R&R before continuing on you easterly journey. You're a real card Roski! Abby wouldn't accept the A/P from anyone - she'd rather stop than do it wrong. don't worry about them rumours, there are more people that love you, but remain silent! I also love your regular blog and pictures! 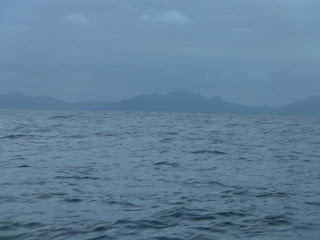 Even a picture of a big grey mass of water will make us happy. Just feels like being with you out there! Even some pictures of the inside of your little universe will make us happy! So... if you get some good winds, you might catch up with Jessica! That 'll be good fun! I see you've got plenty of life forms out there now! Enjoy it as long as it lasts! We are behind you all the way. Forget any negatives and just keep sailing. God speed Abby! Happy Easter... thanks for the new pictures! Keep Safe and all the best on wild eyes! Abby- Great sailing! Could you please give us your wind direction when you are talking about what heading you have to sail. Thanks and fair sailing! What great updates and pictures. You are doing a wonderful job. I am sure that if the autopilot problems cannot be overcome soon, you will take the safe route and abandon the nonstop ambition and duck in for repairs before you get past the point of no return. If I were your dad, I would be in Stanley with a new autopilot just in case. As the plans have not been made public, we can only guess at what is going on. I for one have total confidence in you, your dad and crew to do what is right, with your safety being the paramount consideration. From time to time, some bloggers come up with totally serious and totally innocent comments and questions. When Bonnie made a slip of the tongue she got hammered. She has since corrected herself with deploying a (sea anchor Bonnie). I must confess, I got a real tickle when I read her and other's comments about “just dropping anchor and having a snooze”. It reminded me of a place in Colorado near Canyon City. There is a crack in the Rocky Mountains called Royal Gorge, through which, the Arkansas River flows. There is a bridge over the river called the “The Royal Gorge Bridge”. It is 1,000ft from the bridge to the water below. Don't know if it is still there, but at one time there was a sign on the bridge that said "No Fishing". Abby, don’t listen to rumors and gossip. It will just create distraction from the job at hand. It will always be around. Just ignore it and press on. It is just cheap talk from idiots and self appointed experts who haven’t a clue what they are talking about and do not deserve one second of further thought. So far, I have not seen any of it and if I do, they will hear from me too! My hearty congratulations on your progress so far. If you have to make a stop, so be it. I wish you and your crew the wisdom and self assurance to take the safest course, whatever may come up. With Warmest Regards to you and crew from Hervey Bay “Down Under”. Happy Easter Abby, I haven't logged on in awhile but I do keep watching your progress. You are doing a great job. Don't listen to those who have negative comments. Do the best job you can do and go from there:) Love the pictures, especially Charlie. My family is praying for your safety. God bless you on your ocean adventure. We all wish that you will complete your trip successfully and be back in the comfort and safety of your home. done with your fantastic voyage, what are you going to do with your time! God Bless you girl. You have courage, thats a fact. Be Safe. I wouldn't suppose the company producing this auto pilot will be contacting you for a commercial anytime soon. Git 'er done! God bless you! You're in our prayers. 47 South and 59 Farenheit!